The Construction of this temple is similar to Tirvanadapuram and the darshan is through the three entrances. The temple is constructed in such a way that the sunrays fall on the divine face of Moolamoorthy during evenings. The Lord defeated the demon Kesi, who was creating troubles to rishis, and rested on him. Kesi's wife Asuri prayed Ganga, who along with Tamarabharani created a deluge. On finding that it had no effect, they surrendered and worshipped the Lord by splitting and going around Him and hence the name Vattaru (Vattam - Circle) as per sthala purana. The Lord is called Adikesava as He defeated the demo Adikesi. There is also a Sannadhi for Krishna here. Thiruvattaaru is situated about 6 miles from Thoduvetti, which can be reached by bus in the Thiruvananthapuram Nagercoil route. This temple is similar to the Thiruvananthapuram temole. There are three entrances through which devotees get the darshan of the Lords' face, body and feet. There are huge praakaarams and a Krishna idol. The Lord is said to have destroyed the asura Aadikesi who was disturbing the rishis & devas. The asura's wife, Aasoori prayed to the river Ganges for help. The river Ganges along with the Taamirabarani river rushed as a flood, but the Lord made the land rise as a hill. The two rivers went around the hill in a circle (vattam) like a garland and hence the name Thiruvattaaru to this sthalam. Since the Lord vanquished the asura Aadikesi, he is known by the naamam Aadikesava Perumaal. The spot where the rivers split is called Moovaathu Mugam / Thodhai Pirali. The Moolavar is Aadikesava Perumal seen in bujanga sayanam posture facing west. Theertham - Kadalvaai Theertham, Vattaaru, Raama Theertham. The Lord is very similar to the one in Anantha Shyanam except that Syanam posture differs in both, which is visible on keen observation. 24 miles from Nagercoil in Trivandrum direction. The Moolavar of this sthalam is Aadhikesavapperumal. He is gound in Kidantha Thirukkolam in Bhujanga sayanam facing his thirumugham along western direction. 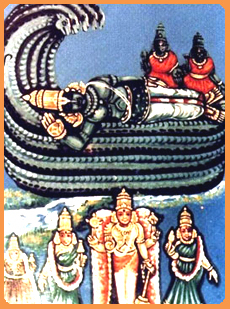 Prathyaksham for Chandiran, the Moon God. This sthalam is situated next to Thoduvetti in Kerala. We can also reach this sthalam by getting down in Thoduvetti while travelling in Bus which starts from Trivandrum to Naagar Koil. After getting down in Thoduvettin, we have to catch another bus and travel around 6 kms to reach this sthalam. There is no staying facility.